One-Punch Man Volume Two collects Punches (issues) 9 through 15 (plus some bonus material) of ONE and Yusuke Murata’s ongoing manga. Determined to deal with an annoying campaign of harassment, nigh-indestructible powerhouse Saitama and his earnest cyborg acolyte Genos set out to confront the mysterious House of Evolution. The adventure is almost over before it begins. Genos’ pre-emptive strike on the tower that he believes houses Doctor Genus’ House of Evolution finds nothing to strike. Luckily, Saitama spots a hidden hatch leading to a subterranean network of tunnels and rooms. The tower was but a distraction; the true heart of the facility is underground. Genus and his legion of clones realize they are under attack. Genus cannot send his A-team, which was reduced to widely scattered body-parts in the previous issue. Genus is forced to free his lethal creation, Ashura (Carnage) Kabuto. Carnage is fast and strong, but kills indiscriminately. Saitama and Genos are under attack, but clones are also dying at a great rate. Can Saitama survive a confrontation with the House of Evolution’s ultimate warrior? And how will the world react when Saitama reveals the secret behind his amazing powers? As you can guess, Saitama wins. Some time after the House of Evolution affair, Hammerhead and the Paradisers — Hammerhead’s legion of would-be layabouts — don stolen powered armour and sally forth to win lives of idle luxury. This would not be Saitama’s problem but for one thing: all of the Paradisers sport shaved heads. The news reports an invasion of baldies. Saitama is a baldie. This could be inconvenient. Saitama must track down and rebuke the layabout terrorists. Saitama is stunned to learn that he is a nobody. Sonic has never heard of the Hero for Fun! Could it be the world’s greatest hero is … completely unknown? We’re never told how Saitama’s training regime (which is daunting but not extraordinary) has transformed him into a caped baldie who can reduce every opponent to a mist of blood droplets and vaporized body parts. The evidence suggests that in this manga, obsession can trigger weird transformations. In a previous issue, a man who ate too many crabs became a crab monster. Saitama set out to become strong and fast and became impossibly strong and fast. This is like a Horatio Alger story (strive and you will win) dialed up to eleven. Why do I revisit One-Punch Man? As is so often the case, the reason is absurd: I will be joining a Mutants & Masterminds RPG campaign; I wanted some pointers on handling super-strong characters. Research is a perfectly cromulent reason to read about people punching other people. The time-tested way to write thrilling stories about superpowered characters is to hand the characters a problem to which their abilities are either irrelevant or counter-productive. In this story, one problem is that Saitama has never bothered with media relations or licensing (anything he does not find interesting he ignores completely). Even the fact that in this world there’s a superhero licensing body (which Saitama’s very first exploit as a hero inspired) comes as a surprise. The other problem that Saitama faces is that he would enjoy a challenging fight — which is impossible. He’s just too strong, fast, and invulnerable. Poor superman. What was supposed to bring him joy has brought him only ongoing disaffection and depression. This is reflected by the art; except in those few moments when something catches his full interest, Saitama’s face is just sketched in; his depression is so profound it apparently affects his artist…. This compilation was slightly more amusing than the first volume. I enjoy the on-going character Genos, who is both straight-man and chew toy. Saitama’s enemies demonstrate their prowess by demolishing Genos before they are obliterated by Saitama. It’s a good thing Genos, like the Metal Men, can be rebuilt…. 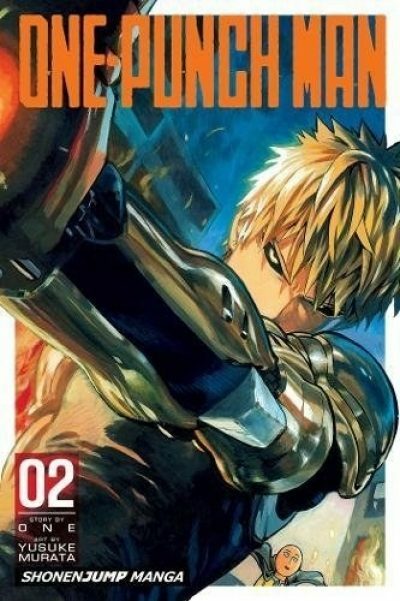 One-Punch Man, volume two is available here (Amazon) and here (Chapters-Indigo). 1: Except for Hammerhead, who survives because people mistakenly attack his invulnerable head.